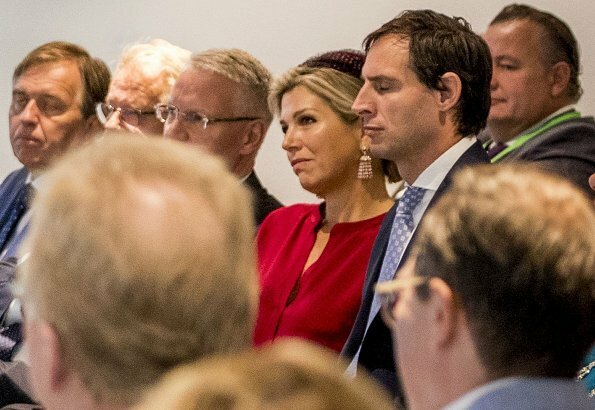 On October 17, Wednesday, Queen Maxima attended celebrations of 40th anniversary of Dutch Association of Insurers (Verbond van Verzekeraars) in the Hague. 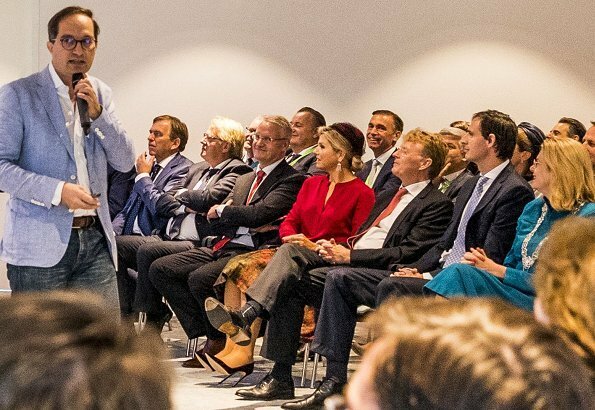 During the celebrations, the Queen reopened the office of Dutch Association of Insurers, which has been modernized and renovated, and attended a symposium on the affect of technology on the future of insurance sector. Dutch Association of Insurers is one of the partners of Platform Wiser in Money. Queen Maxima is the honorary president of the platform. Not just Maxima, where in the world are these royal ladies getting their clothes. Most of the ones I have seen lately I would never wear. I agree, they look dated! Very 80’s! Maxima's top is a nice color it also looks good, her earrings are a wow. I do like tartan skirt's,but this one looks a bit odd, the way it is. Her hair and hat are OK too. Here the top is very nice and the skirt is ok as well. I think it is normal you would not wear their clothes, they are not chosen according to the same criteria. Maxima has really been pushing the envelope with her fashion choices lately. I do not like this skirt or the one she wore the other day that looked like a child’s kindergarten project. She looks great in classy lines and can affford the best but sometimes I wonder if she actually looks in a mirror when she tries on some of these outfits. I think she rather likes to dress not by necessarily what compliments her but by what she likes. That is why she should consult with a stylist. Beautiful blouse in a rich colour. Everything else she´s wearing is horrid. The skirt looks like an upcycle experiment and those hats (that she weirdly seems to like) just look ugly. Another terrible skirt and hat. Wrong colours. Agree,many items together without a sense of style. I understand some Dutch people love her smile, and are proud of her. But fashion wise, she is getting to be a parody of herself. Her hair, her hats, her overdone ill fitting style. She is in dire need of a stylist. She has worn this weird skirt before and I didn't like it then, and I don't like it now. To be positive, it's an improvement on yesterday's outfit. If this was a plain straight skirt in this fabric it might be okay but thus widely flared skirt does her no favours. Not the most flattering skirt for anyone in cut and style although I like the fabric. Above the skirt she looks wonderful - love the rich jewel colour of the top. zoek het niet te ver, deze rok, in dikke stof, bah. What I see with this skirt is a ruffle right at the abdomen, where you want to look your flattest. Such a poor design. The blouse is nice and the tassel earrings are great. Agree. No woman could look good in that skirt. What was the designer thinking? La blusa es bonita, la falda espantosa y el casquete, ridículo. Al menos se ha recogido el pelo, eso va bien. Maxima is amazing. Even this outfit is almost ok on her - the skirt is quite unflattering though. But her personality is so sparkling that she looks fine what ever she wears.